Age, heredity, prior surgery, and a number of other factors can lead you to a place where you might consider this procedure for your aesthetic enhancement needs. Beverly Hills Plastic Surgery Group has a long track record of successful tummy tuck procedures under our belt. We also house the state-of-the-art facilities, technology, and instrumentation necessary to build a reputable aesthetic enhancement practice in a city with the particular type of demand that Beverly Hills possesses. Of course, the tummy tuck procedure is meant to be utilized in conjunction with a healthy diet and daily exercise routine and is in no way intended to be a substitute for these life-altering habits. A great diet and exercise routine will help ensure optimum results. 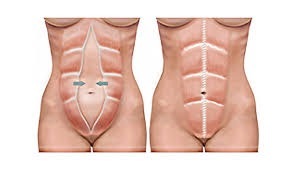 There are a variety of types of tummy tucks depending on the extent of excess skin and fat that need to be removed and whether or not there is muscle separation that needs to be repaired. The mini tummy tuck removes the skin from the lower abdomen, which won’t affect the upper abdomen. Can also be done in combination with liposuction of the upper abdomen and surrounding areas when needed. This type of TT addresses skin laxity below the belly button and does not repair muscle separation. This is a full tummy tuck, but an extended procedure to remove the additional skin on both sides of the abdomen. This procedure is ideal for when a patient wants to focus on and tighten their sides when a patient desires to lose a significant amount of excess skin and fat. This allows more skin to be excised and is most commonly used for patients that have lost a significant amount of weight. Your tummy tuck consultation with Dr. Danielpour and Dr. Layke is a unique and pleasant experience. You are seen and evaluated by two board-certified plastic surgeons that have worked together performing surgeries for over 10 years. Both of them will evaluate you and give you their recommendations. You are basically getting a second opinion at the same time. The Doctors will then meticulously tailor a plan designed specifically for you. Beverly Hills Plastic Surgery Group conducts our tummy tuck surgeries with state-of-the-art, fully-equipped, brand new operating rooms located in our brand new Beverly Hills facility. This facility is certified by the American Association for Accreditation of Ambulatory Surgery Facilities, Inc. (AAAASF), an organization that recognizes surgical operating environments that set, develop, and practice the highest standards of care. The tummy tuck is not a scar-free surgery. Length and size of scars will depend on a variety of factors, including the amount of skin removed, your own body’s unique ability to heal and scarring process, as well as the tummy tuck technique used. We execute our tummy tuck procedures as conservatively as possible. We use the smallest incision possible, leaving the minimum amount of scarring, which can be concealed by a standard bikini. We also use the Embrace Scar therapy system in order to provide the best results with minimal scarring. We also inject a long-acting pain medicine (Experel) at the time of surgery to alleviate immediate postoperative pain. We will encourage you to walk around the very next day after your procedure. There will be some recovery time that should be planned ahead for, depending on your line of work. If your job is sedentary (mostly done in the seated position), you can return in as little as a few days to a week. If you work a more labor-intensive job, it could take up to 10 days to get back to your routine. There is a strict 6 week period of no exercise or heavy lifting to ensure proper healing. Contact Beverly Hills Plastic Surgery Group today to schedule your initial consultation. We will discuss your aesthetic enhancement desires and develop realistic yet ambitious goals. Together, we will determine which variation of our tummy tuck procedures suits your needs best.